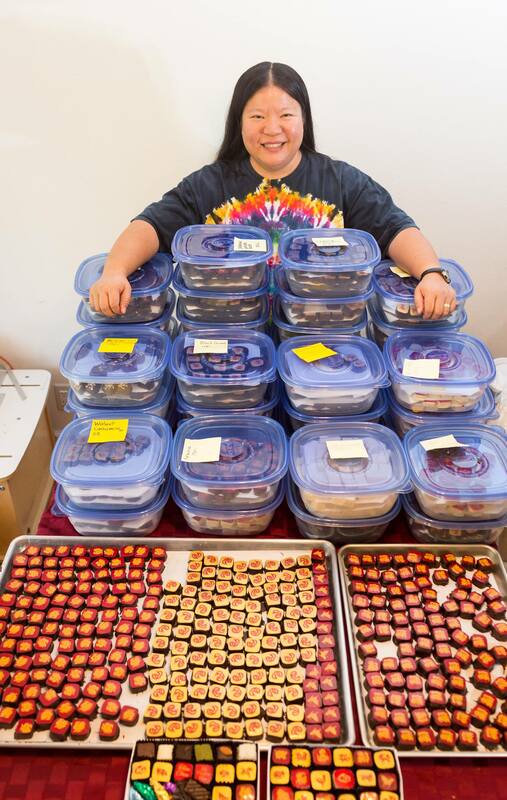 This was a record-setting year for chocolatiering: 136 pounds, 2 ounces of bonbons, in 38 different varieties. 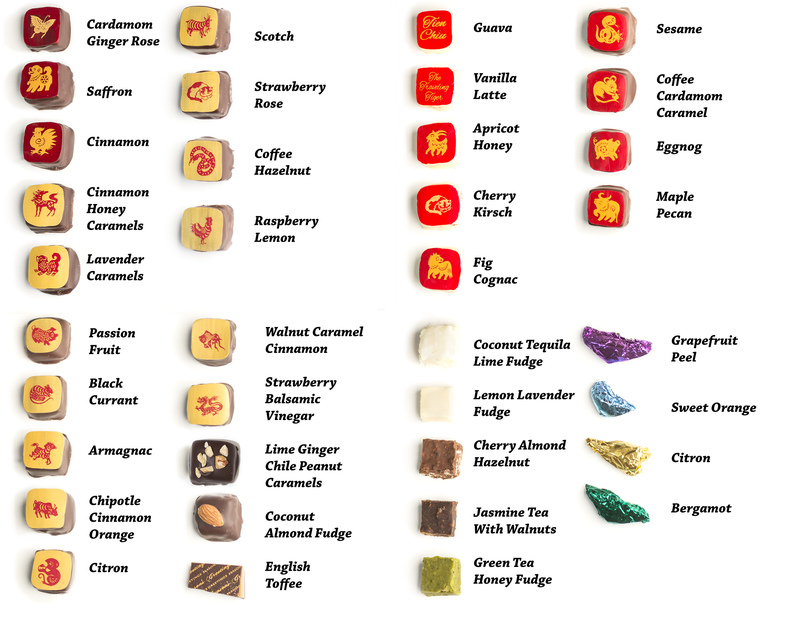 Alas, one of the varieties would not fit, so the peanut-butter-and-jelly ones did not make it into the boxes (and thus are not listed in the index). But I can assure you they were delicious! 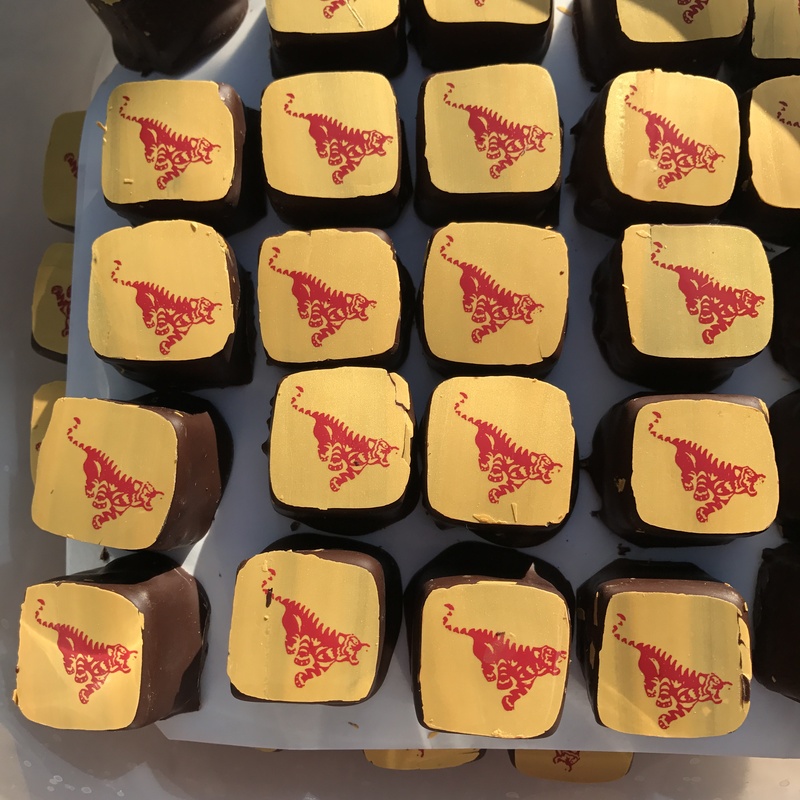 Yesterday eight friends came by and helped pack 3,000 chocolates into candy cups and then into boxes, tied the boxes neatly with red ribbon, and packed them away for shipping. There were 83 boxes total – 40 for donors, 41 for friends, family, and a few select business associates, and 2 that I’m holding in reserve should a box or two get lost in the mail. 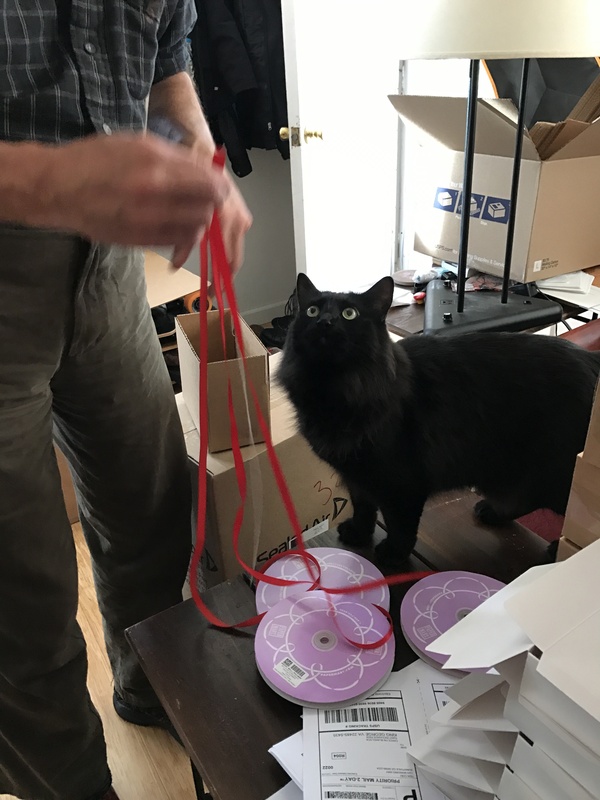 While Tigress mostly hid from the hordes of people, Fritz was ecstatic about the hordes of people who were clearly invited over just to pet him! Alas, they were mostly busy packing chocolates (how terrible! ), but he did find some beautiful cat toys, made just for him. Apologies for not posting earlier! I have been exhausted from laboring in the chocolate mines. 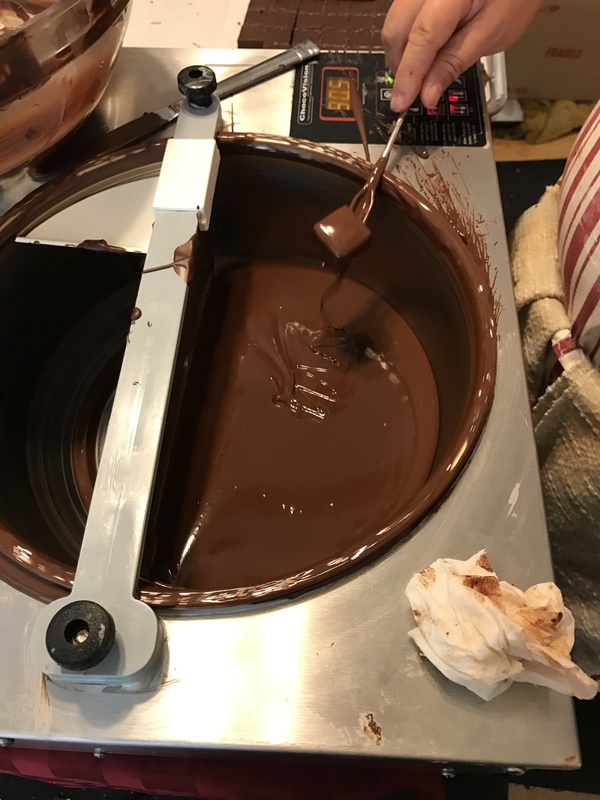 It’s a difficult and dangerous job; first one has to locate a vein of chocolate, then blast out the surrounding rock, then refine the chocolate ore into pure molten chocolate, before it can be put into bonbons. 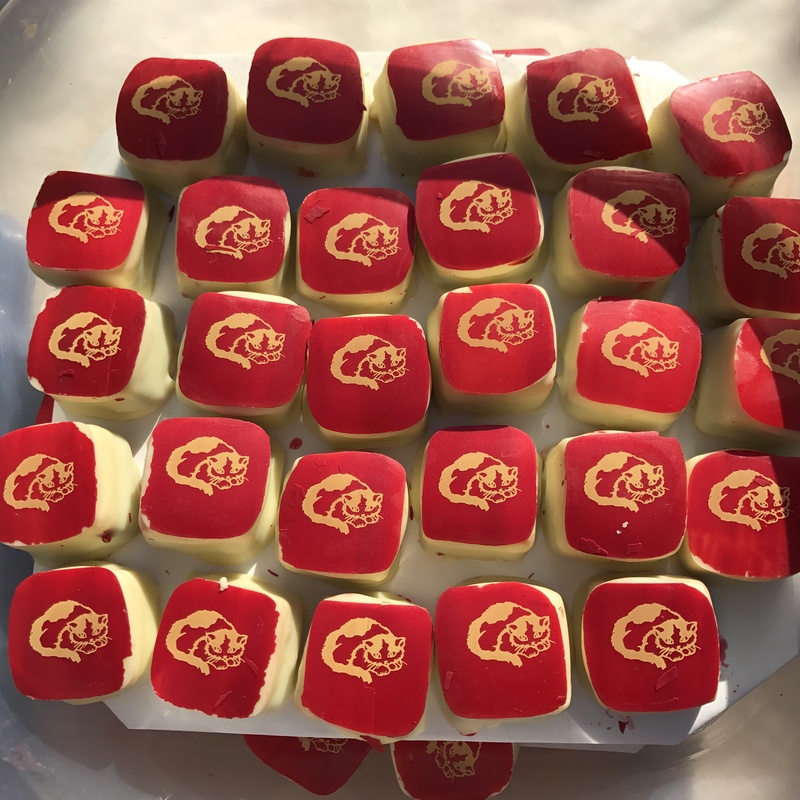 😉 But I have been persevering, and while the mining company refuses to allow photos in the mines due to the grueling nature of the work, I have some photos of the bonbon-making part of the process to share with you all. 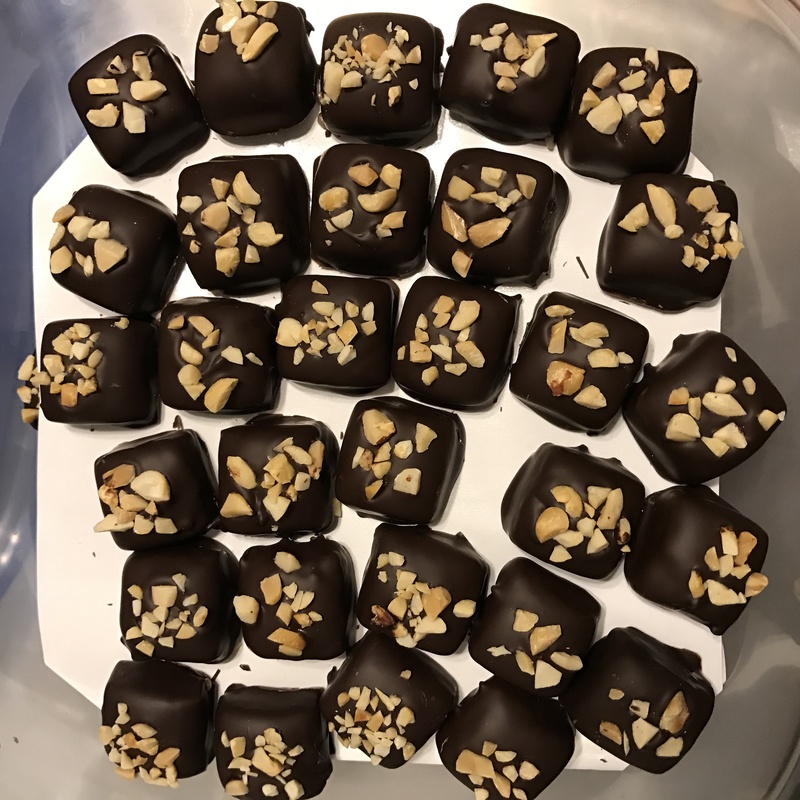 To avoid ugly, grainy bonbons, you temper the chocolate before using it. 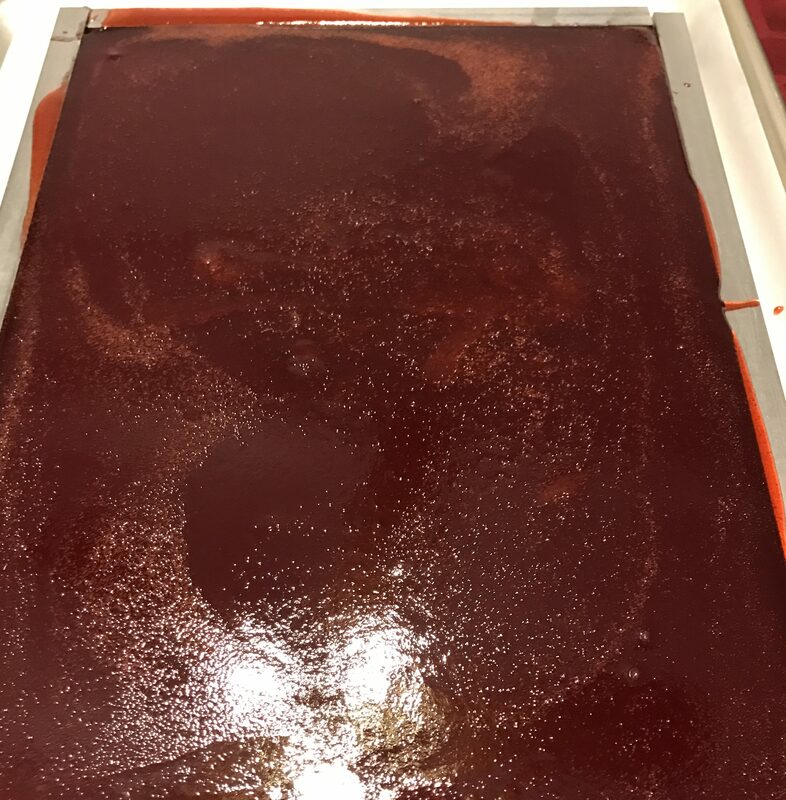 In the traditional method, you melt the chocolate until all the crystals are melted, then pour the molten chocolate onto a marble slab and scrapes it around until it begins to thicken. Then you quickly heat it to working temperature (about 88-90 F) to use it. 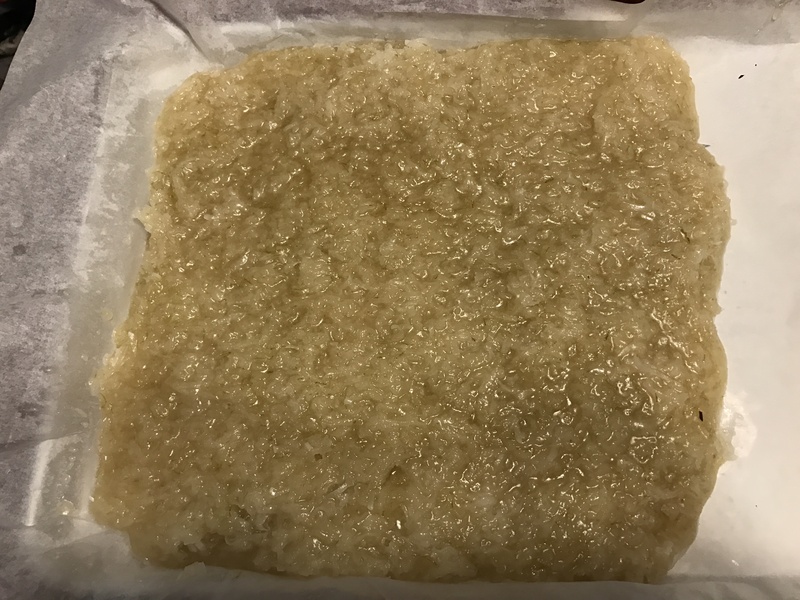 The rapid cooling and scraping on the marble precipitates the formation of lots of small seed crystals; heating it back up to 88-90 degrees melts all the unstable cocoa butter crystals, leaving you only with the stable kinds. 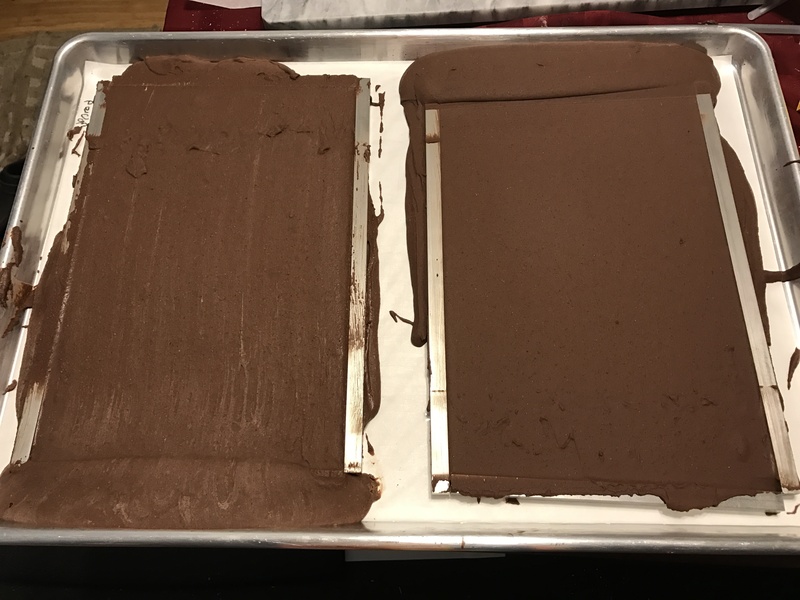 The other method is to melt up the chocolate to 130 degrees, then cool it rapidly by dumping in hunks of previously-tempered chocolate. 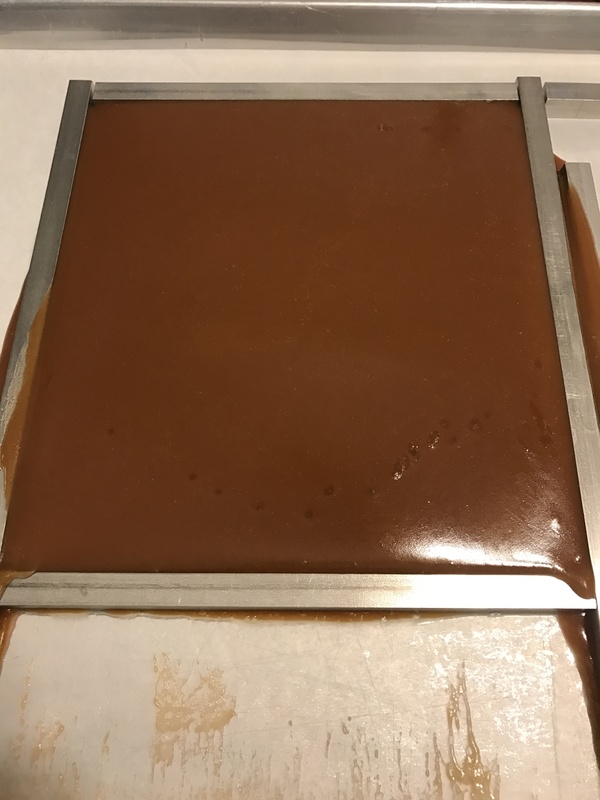 As the tempered chocolate melts, they seed the molten chocolate with the stable crystals, and all is well. The only problem is that one then has hunks of solid chocolate in one’s tempered chocolate, resulting in lumpiness. The molten chocolate stays on the front side, the solid chocolate stays on the back side. 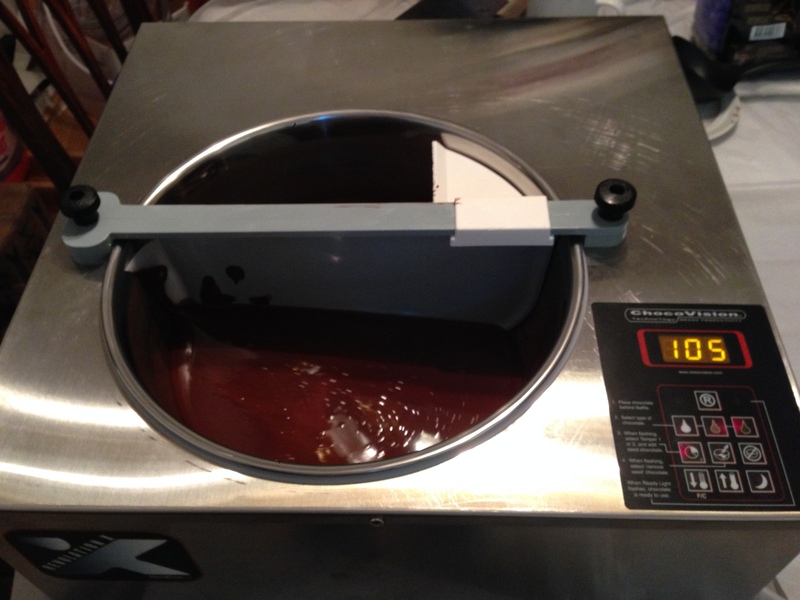 The bowl rotates to mix the chocolate, and a thermocouple embedded in the plastic divider senses the temperature, allowing the machine to heat or cool to keep the chocolate at the ideal working temperature. 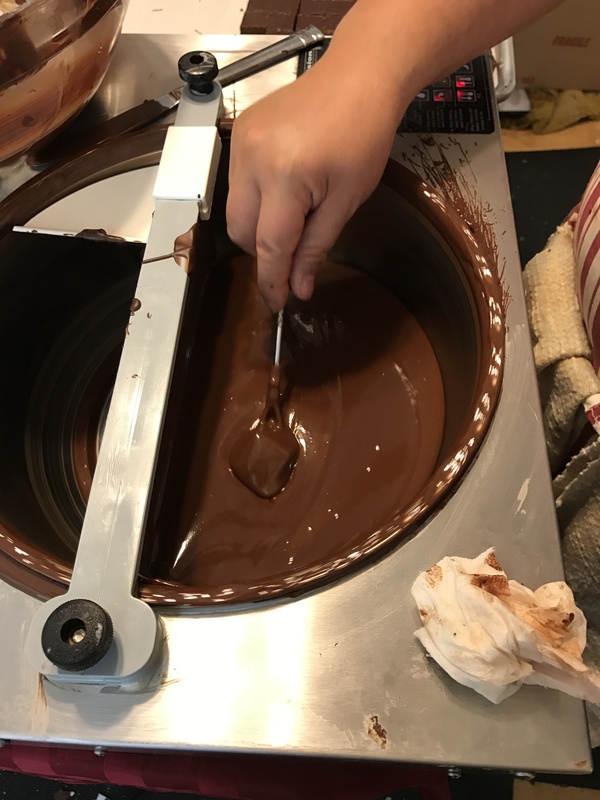 The center is covered with more melted chocolate than necessary, so I shake the chocolate a little, then tap the dipping fork on the side of the bowl (a little tricky, since the bowl is continuously rotating). Then I scrape off the bottom of the center as I take the chocolate out. 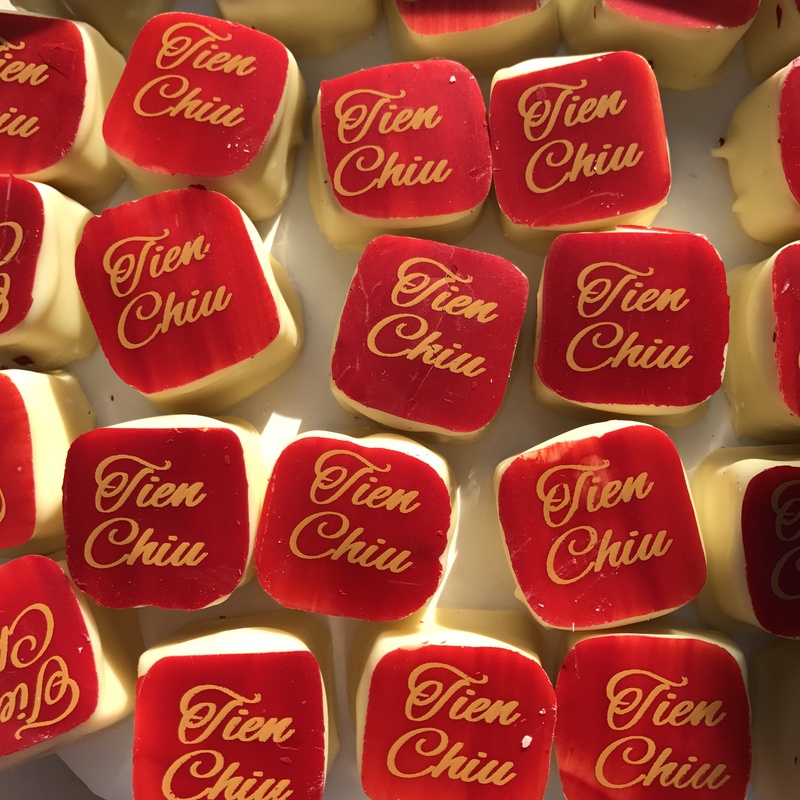 Then you slide the bonbon off onto the tray. 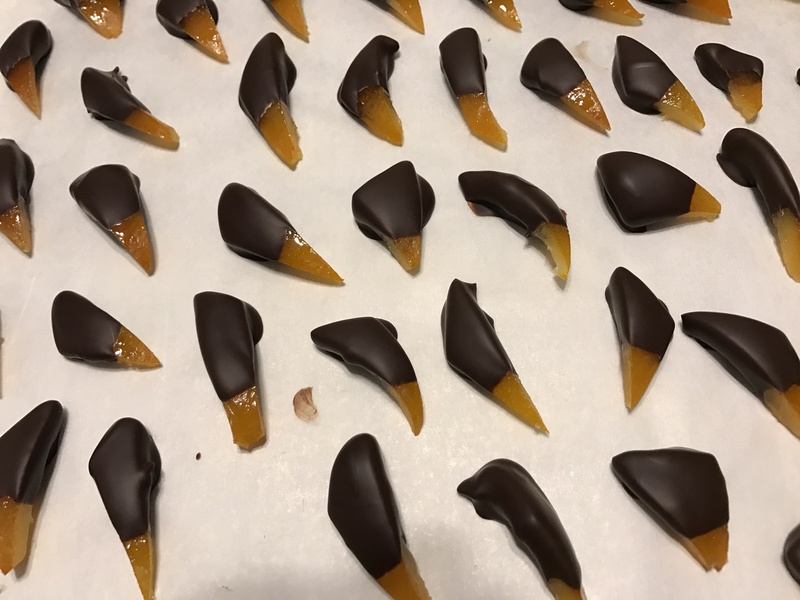 The chocolate tends to run off the front side, forming a little puddle at the bottom, so to avoid having an unsightly “foot,” you push the bonbon forward ever so slightly as you deposit it. This hides the “foot” under the bonbon. Here’s a chocolate being deposited onto the tray. In this photo, I’ve actually already pushed the chocolate a bit forward, so no foot is visible. Once the chocolate is deposited onto the tray, it needs to be decorated. 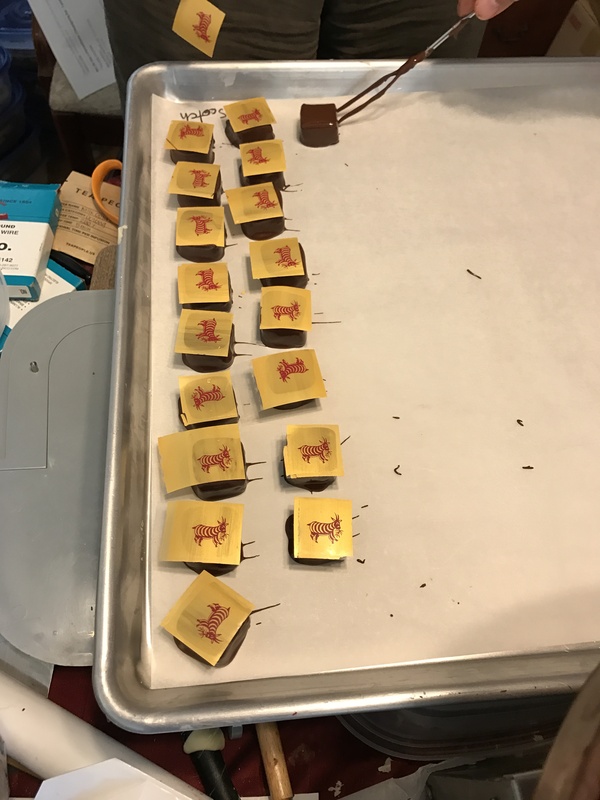 So we typically have two people at a dipping station: one person dips the chocolates, the other puts on the transfer sheets. This are sheets of smooth plastic screen printed with a design (I use Chinese paper-cut animals because I like the look), then hand-painted with subtly sparkly, colored cocoa butter to give a textured, glistening look to the backgrounds. 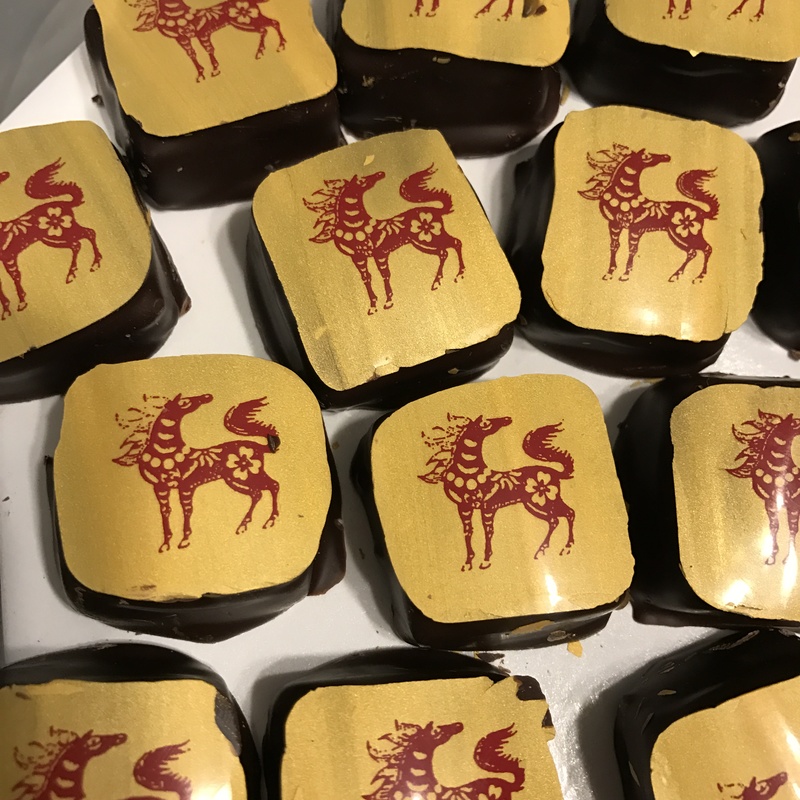 It takes six or seven hours to paint the transfer sheets and another 6-7 hours to hand-cut the sheets, one by one, afterwards – so it is a royal pain but worth every instant, as it produces beautiful chocolates. 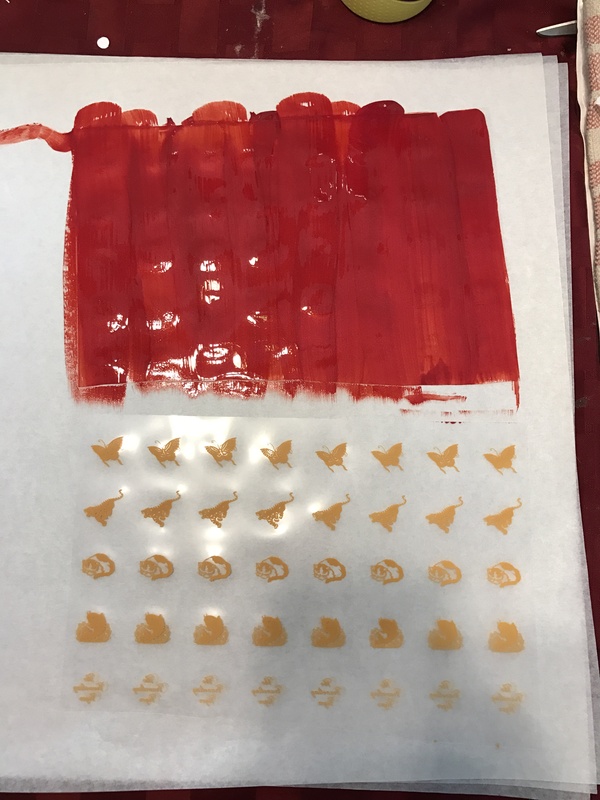 Applying transfer sheets looks simple but can be a bit of a challenge. 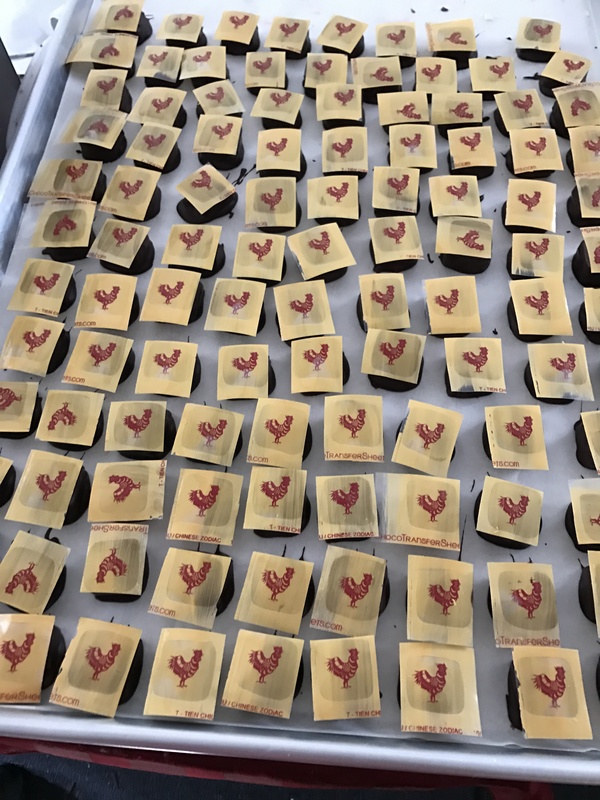 To start, you need to apply the transfer sheet as soon after dipping as possible, because the transfer process relies on the heat from the melted chocolate to fuse the cocoa butter design to the chocolate. If you don’t apply it quickly enough, the transfer looks ragged or doesn’t work at all. Then, you want all four corners clearly visible, so you need to press down evenly, but if you press down too hard, the chocolate on the top slides downward, resulting in an unsightly “foot”. The design also needs to be centered on the chocolate, so careful placement is important too. So, while not as tricky as dipping chocolates, this does require skill and a delicate touch. 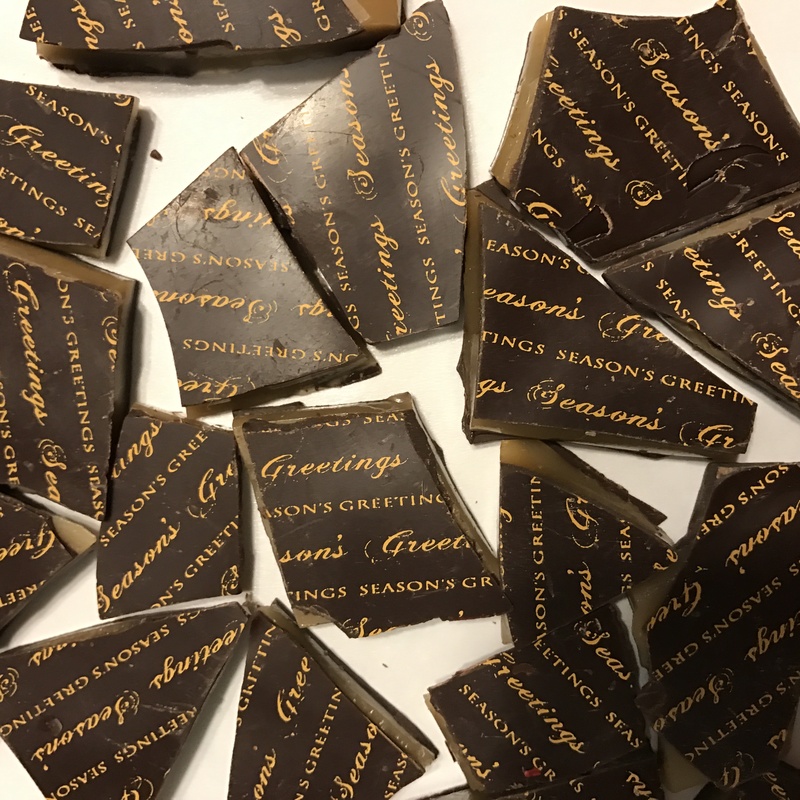 Once the chocolate has hardened sufficiently (several hours to a day depending on room temperature), you peel away the transfer sheets, trim off the colored cocoa butter by running a gloved finger around the edge of each and every bonbon, trim away any “feet”, and put the chocolates away. This takes about half an hour per tray – which doesn’t sound like much, but adds up to 18 hours over the course of making 36 flavors. And that’s today’s peek into life in the chocolate mines! 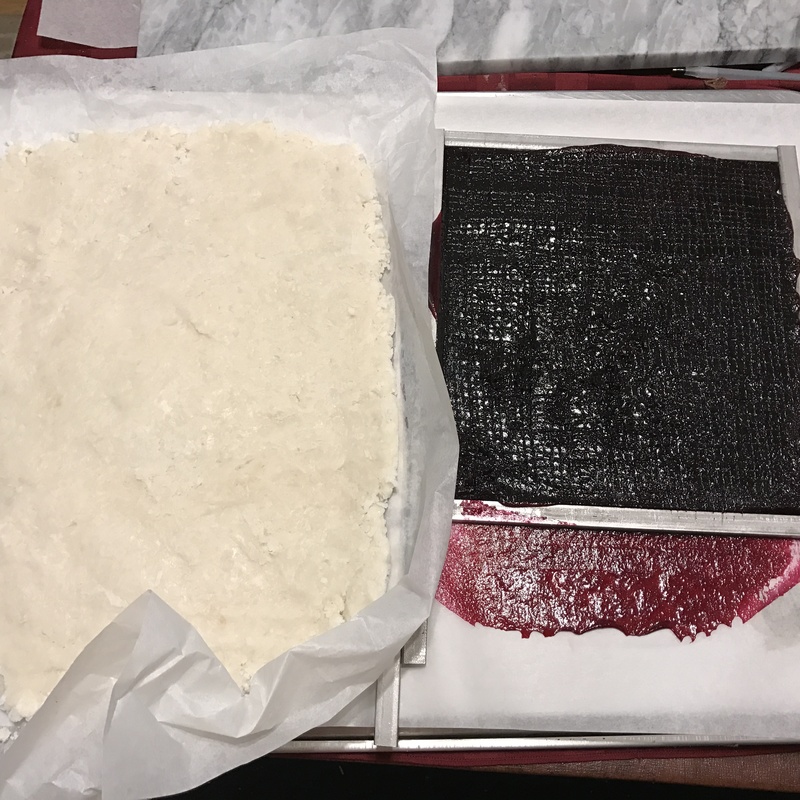 And, finally, here are coconut fudge and a thin layer of Concord grape fruit gel. 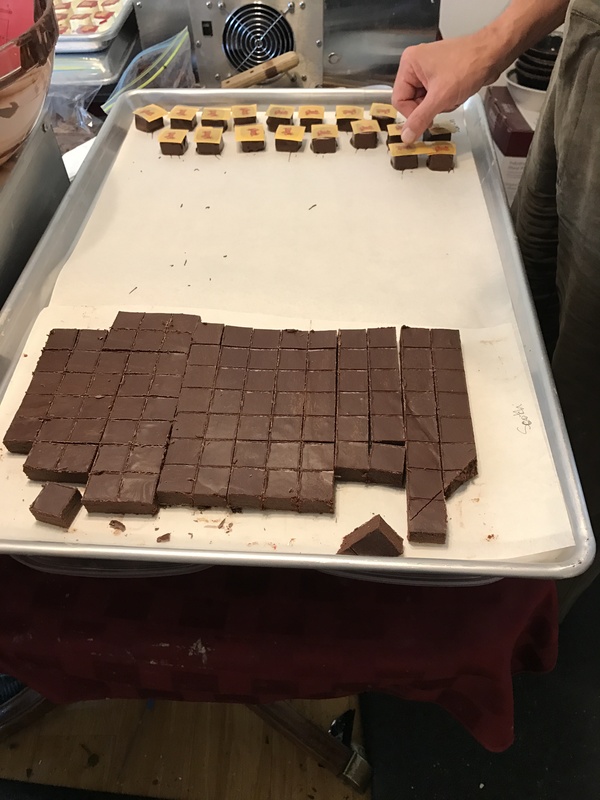 The coconut fudge will get dipped in chocolate with an almond on top (making a very high-class Almond Joy), and the Concord grape fruit gel will get a second layer of peanut butter gianduja poured on top. Yes, that’s right – I’m making a chocolate peanut-butter-and-jelly sandwich! 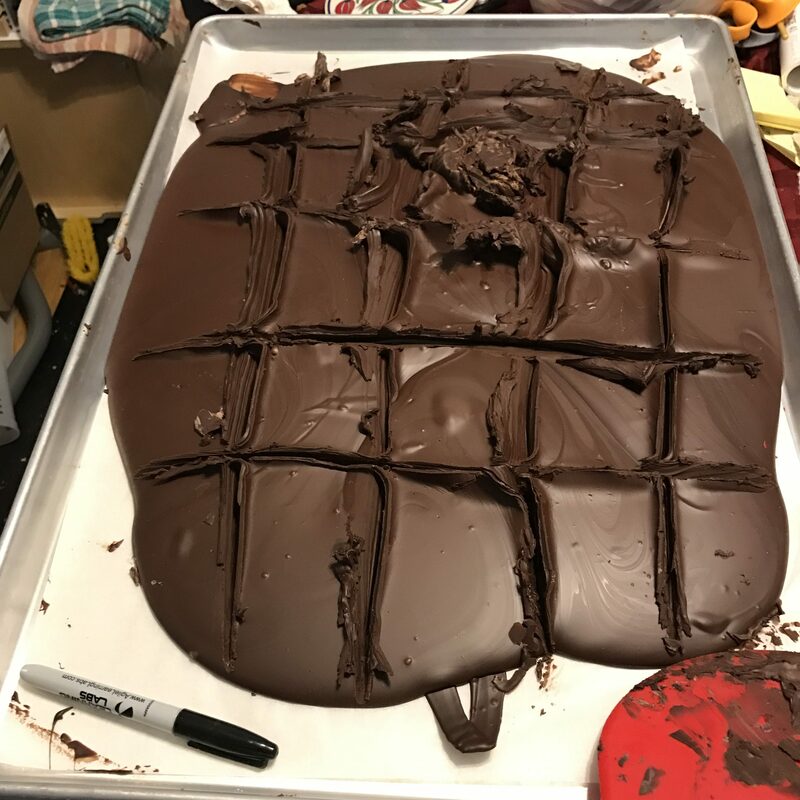 The “score” so far is 28 pounds, 1 ounce of finished chocolates. Only ~100 pounds to go! 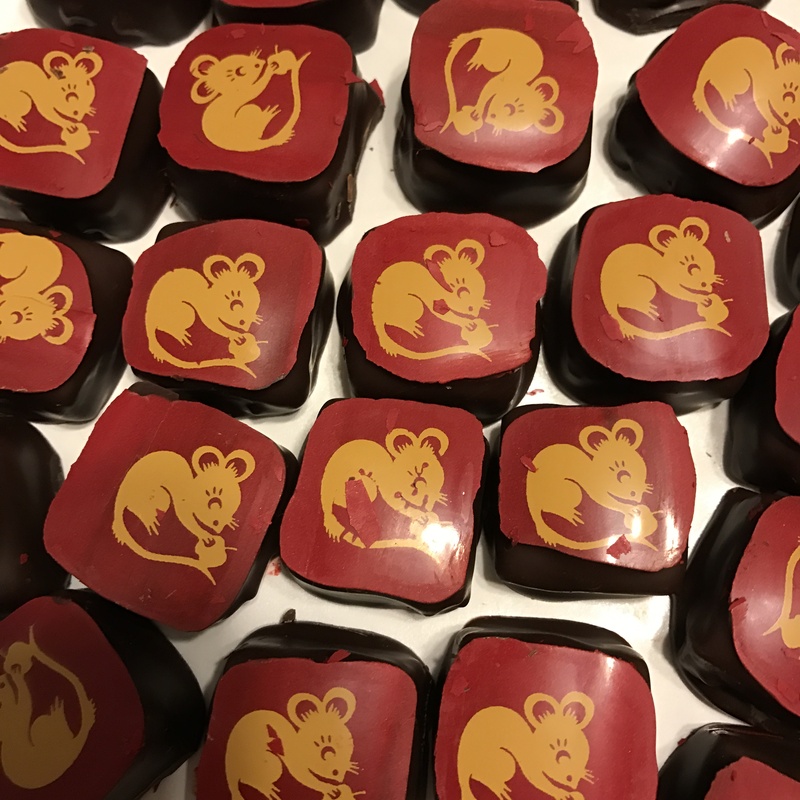 Chocolate season has begun! I kicked it off on Tuesday with green tea/honey fudge and jasmine tea/dark chocolate/walnut fudge. 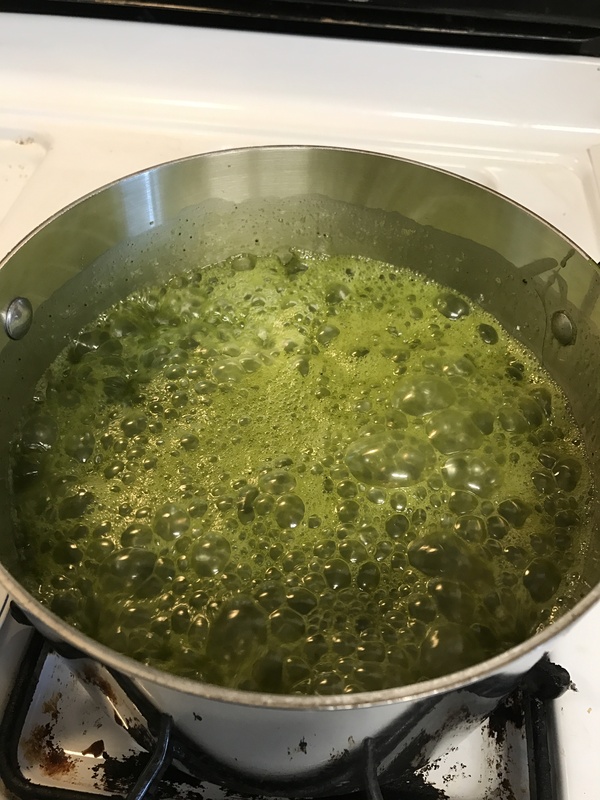 Here’s the green tea/honey fudge in progress – doesn’t it make a fabulous witches’ cauldron? 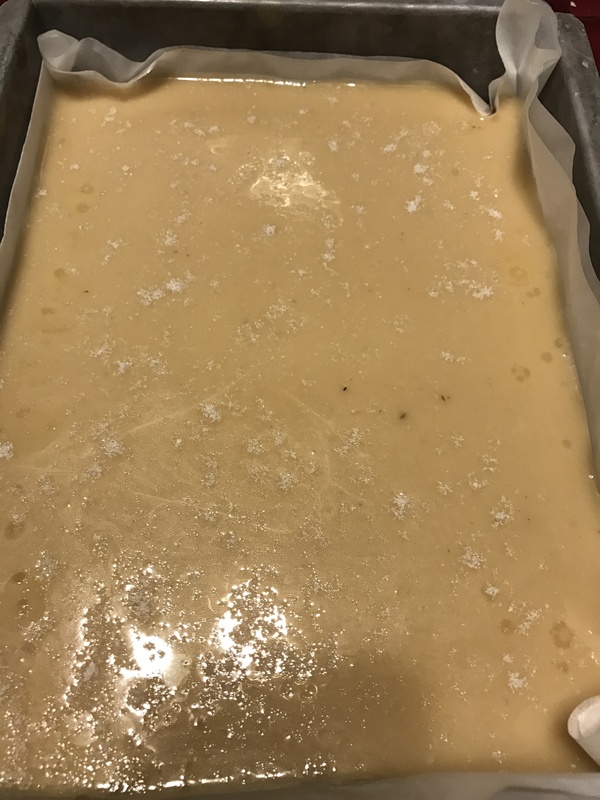 This fudge is actually made with Meyer lemons, which are a cross between a lemon and a mandarin orange…it has a fruitier and more floral taste than the Eureka lemon you see in supermarkets, which pairs very nicely with the vanilla flavor in the white chocolate. 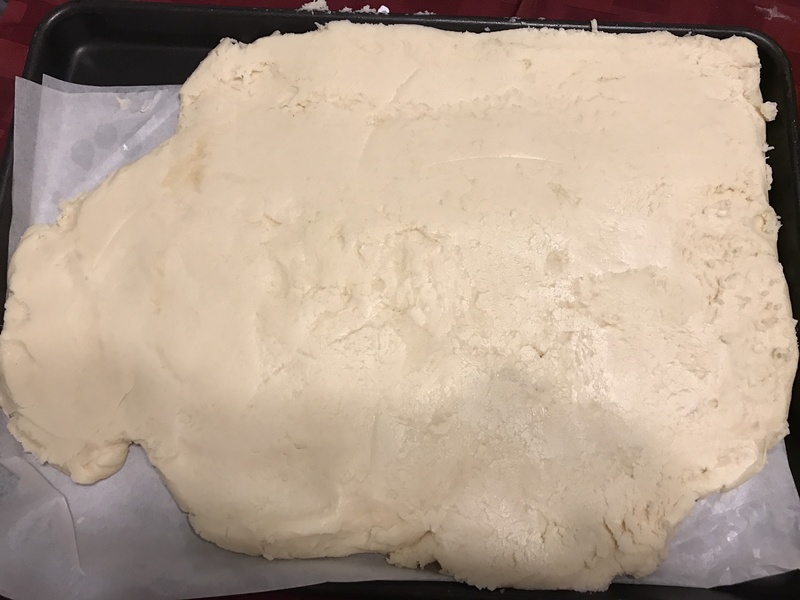 Anyway, once it’s fully crystallized it will become opaque and bright white – and delicious. This one’s really nice – I used Vietnamese cinnamon from Penzey’s (a wonderful source for fresh spices), which has a bit of a kick to it. So the flavor is intensely cinnamon, a little bit hot, and with a honey finish. 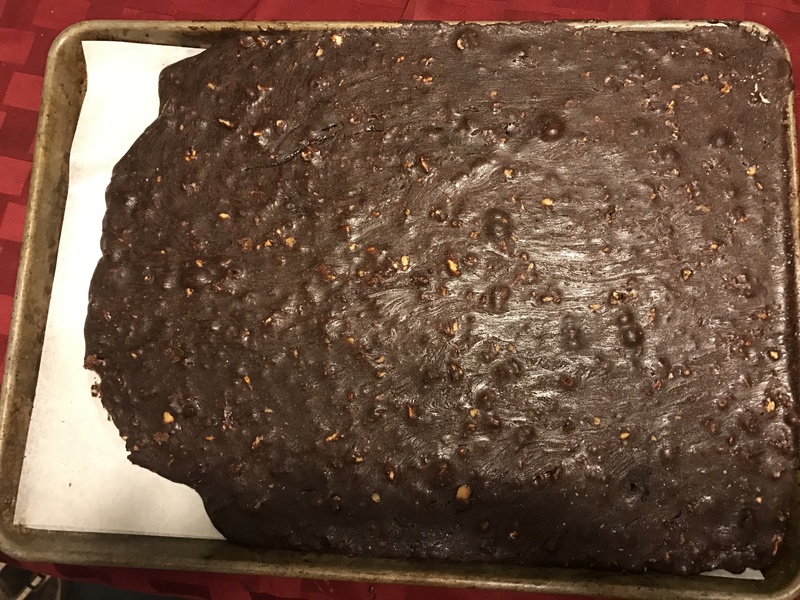 I taste-tested two versions on last year’s coworkers – one batch with fleur de sel (French sea salt) sprinkled over it, and one batch with no salt. Interestingly, while people couldn’t identify what was different between salt and no salt, they preferred the salted version. So, sea salt it is. These designs are made by using chocolate transfer sheets, which are basically decals made of cocoa butter (for those of you old enough to remember decals, that is!). 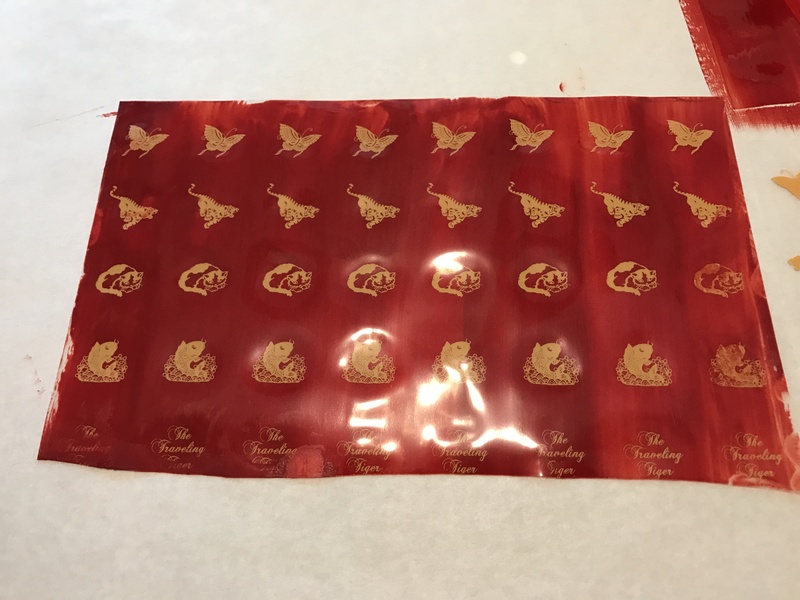 You screen print designs on a sheet of acetate using thickened cocoa butter. 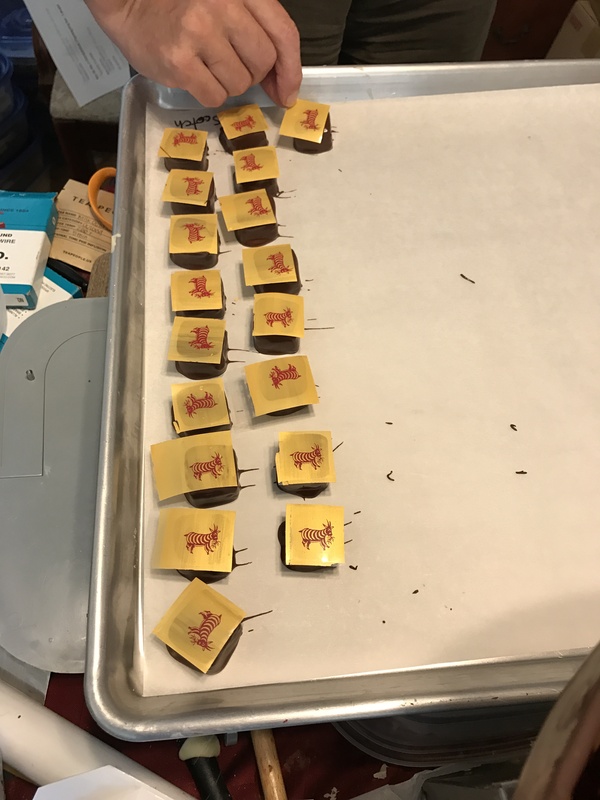 Then you dip a center in chocolate, and immediately lay a transfer sheet on top. 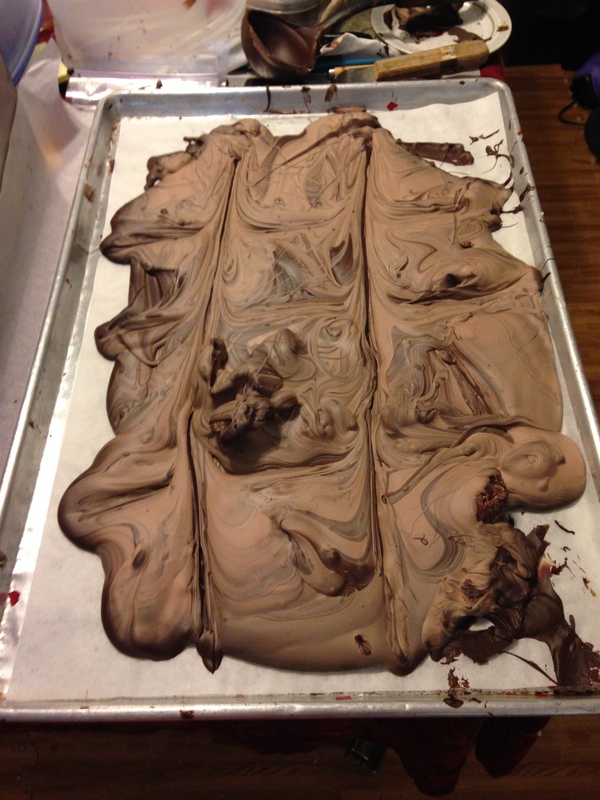 The still-molten chocolate melts the cocoa butter on the acetate, merging the cocoa butter into the chocolate. 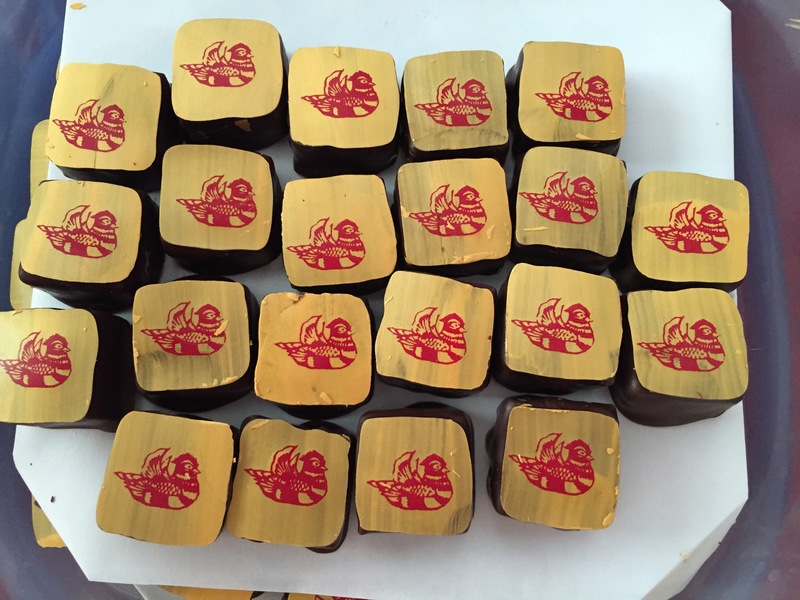 Then, after it hardens, you simply peel away the transfer sheet, leaving the design on the chocolate. Notice you can still see the brush strokes – that’s intentional, as I love the slightly textured effect this produces. This morning, my goal is to make one final batch of fudge, and three more flavors of caramels. 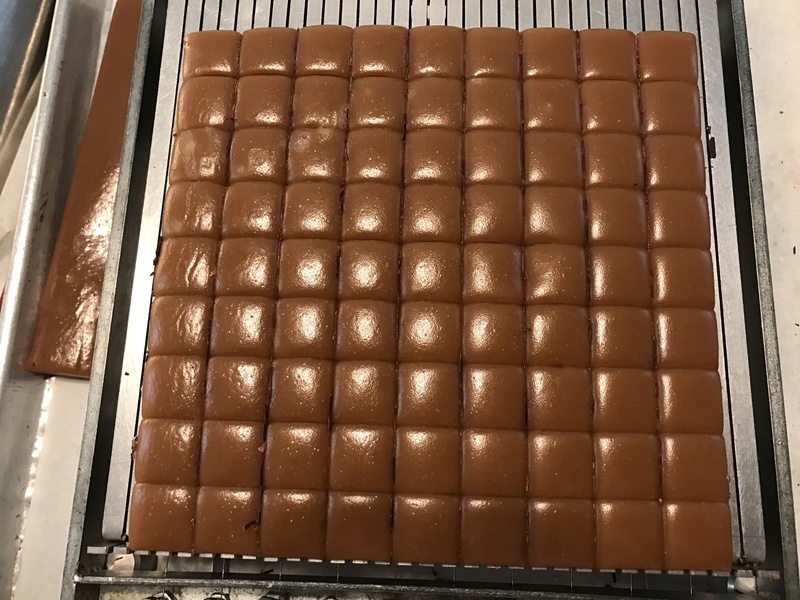 In the afternoon, I’ll pull out the chocolate tempering machine, and start making those pans of caramel into some seriously luscious bonbons!